Once you find water, a major issue remains: is it pure? Is it drinkable? And if not, how to make it drinkable? In today's world this is a much more complex issue than it was previously. Just 20 years ago in Canada you could still drink water from the streams, rivers, and lakes in the north -- for example, in northern Ontario, including northern Lake Huron and the Bruce Peninsula. However, the spread of Giardia in recent years has greatly increased the risk of drinking water straight from these sources. Giardia is a non-native organism (actually a cyst) that can seriously debilitate you if you get it. It infects your digestive tract. The primary way it spreads is through the droppings of beaver. However, recent research has suggested that other animals spread it as well. Additionally, industrial and chemical pollutants are probably more widespread than they were in previous years. Certainly they are more widespread than 50 years ago. And this in spite of increased awareness of the dangers of these! One important point to remember: segregate the containers you use. Always use a different container for impure water from the container you store purified water in. Never mix the functions of the two types of containers. That is, never store impure water in the container that you are using for purified water, and vice versa. Here are some general rules for water purity. Please bear in mind that these are general rules only. Every situation must be assessed on its own. This section does NOT take into account pollutants (see next section). Running water is generally better than still water. The modern world has added a whole layer of complexity when it comes to assessing water purity: human-made chemicals and pollutants. And even if there are no human-made, manufactured pollutants in an area to worry about, human activity such as mining releases elements that may be harmful, such as heavy metals, mercury, cyanide, arsenic, etc. Here are some general rules to follow. Again, every situation must be assessed on its own. Stay away from water that is near roads. Automobile engines spew out a very toxic brew of pollutants that are harmful, and they don't all go up into the air. Don't drink water downriver of mine sites, industry, factories, cities and towns, or any human habitation. Don't drink water that has passed through agricultural lands - it may contain fertilizers and pesticides. This is the surest method of purifying water of bacteria and microbes. Sources conflict as to how long it is necessary to boil water to kill all of the harmful microbes. However, it should be boiled at least 5 minutes, and boiling for more like 20 minutes is probably the safest. Boiling water requires heat, and therefore a fire of some sort. And as well you will need a container. If you have a fire-proof container, then you can put the water into the container and place the container on the fire. Otherwise you will need to use rock-boiling. With rock boiling you place stones in a fire, wait for them to heat up, then remove them and place them into the container full of water. The water will quickly heat up as the hot rock transfers its heat to the water. You will need enough rocks in the fire to keep adding them to the container of water often enough that the water comes to a boil and stays boiling for the required time (5-20 minutes). From a non-primitive survival point of view, there are a number of good water filters on the market, which will remove most bacteria as well as giardia. In a primitive survival situation, there are a number of different ways to filter water. 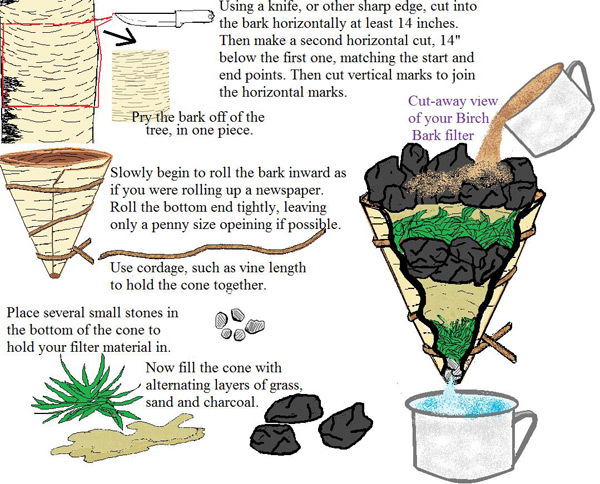 You can make a water filter from a cone of birch bark. This cone is then filled with layers of sand, charcoal, grasses, and other materials. Grasses and sand help to trap suspended particles. Charcoal helps to remove chemical impurities, but not bacteria (as is sometimes commonly believed). You may have to pass the water through the filter more than once, depending on the size of the filter and what it's made of. Generally speaking, the bigger the filter, and the more layers you have in it, the better. The birch bark cone will need to have a fairly small hole in the bottom. The cone will have to be tied with cordage to keep it from opening up. Put a few stones in the very bottom, to help hold your filtering materials in place. Then pour in layers of charcoal, grasses, sand, and possibly other materials that you feel will help to filter out suspended particles and perhaps even bacteria. Once you have constructed the filter, simply pour impure water through the filer, catching it in another container at the bottom. This is an excellent method, when sunshine and appropriate materials (to build the solar still) are available. Build a solar still (described elsewhere). Then place the impure water into the solar still pit and allow it to evaporate. It may be best to use a cloth or other absorbent material to soak up the impure water, place that into the solar still pit, and allow the water to evaporate from that. The water in the pit will evaporate, collect on the underside of the solar still cover and drip into your collecting container.